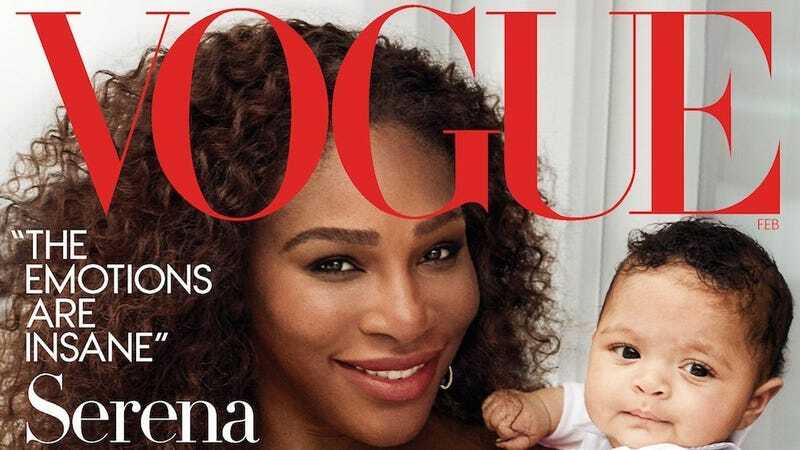 Serena Williams is on the cover of February’s Vogue, with her very cute, somewhat skeptical looking daughter, Alexis Olympia Ohanian Jr., a.k.a. Olympia. This kiddo gets it. “Maybe this goes without saying, but it needs to be said in a powerful way: I absolutely want more Grand Slams. I’m well aware of the record books, unfortunately. It’s not a secret that I have my sights on 25.” She means 25 Grand Slam victories, which would surpass the record of 24 held by the Australian tennis legend Margaret Court and make her the undisputed greatest of all time. The piece also goes into frightening detail about postpartum complications that Williams, who has a history of blood clots, faced. Feeling short of breath, she insisted to skeptical hospital staff she needed a CT scan and a specific blood thinner right away, and—sure enough—she was right. But that made it nightmarishly complex when her incision from her c-section reopened, and she was stuck in bed for her first six weeks home. No wonder she is somewhat annoyed with Roger Federer: “It’s so unfair,” she said. “He produced four babies and barely missed a tournament.” The eternal cry of moms surveying the dads among their colleagues. See the rest of the photos by Mario Testino here.